Flowers from Malaga Garden Center will make any occasion extra personal and special! Proudly serving Jerusalem, Ohio and the surrounding area, we’re a premier full-service florist and Greenhouse that is family-owned and operated. We will take personal care and attention with your purchase to ensure a you brighten their day! We only use high quality flowers. YOU WILL GET YOUR MONEY'S WORTH! Our roses, for example last MUCH longer than standard roses. But we don’t charge you for that upgrade! We will constantly strive to keep rotating our flower stock. We will not be selling you something that's been sitting in our cooler for 2 weeks. We want you to have life in your arrangments! Occasionally we may have sales on ones that don’t have as much life left. Purification: Most of our vases have water with Purification essential oil to help prolong the life of your flowers! This is a free service to you! Style: We are proud to offer new styles of designs including Farmhouse Chic!! And still continue to provide classic styles, but maybe with a slightly trendy twist. We are big proponents of our arrangements ‘living on’, we encourage vases and planters with an extended purpose so even after the flowers are gone, the recepient can continue to think of you! If you’ve been considering a gift instead of flowers I encourage you to reconsider! Maybe try a combination of the two! Flowers just make people happy and they are good for you as well!! Vases: Standard vase included, vase/planter upgrades available price depends on vase. Standard pick and small card included. Make Malaga Garden Center your first choice for premium floral and gift items for any occasion! You can always depend on us to help you with flowers for the Birthday, Anniversary, funeral of a departed loved one or friend, or any "Just Because" occasion you may have. We will design and deliver a funeral arrangement that beautifully conveys your expression of love, joy, sympathy, or "thinking of You". Also enjoy our Air Plant, succulent and Essential Oil Birthday parties or Ladies' Nights! You'll love the individual attention and uniquness of this theme! Your guests will love what they get to take home! Wedding Flowers and Party Flowers from Malaga Garden Center will ensure your special day is a blooming success!! Call us in advance at 740-472-1116 to set up an appointment with Larissa at our adorable Coffee Consultation Counter! Dish Gardens, Lasting SYmpathy Gift selection, Lanterns, Primative style churches and woordowk, Concrete Stone benches, plaques and statues, Throws, Quilts... You na,e it and we can help brighten their day, week and year. Browse our assortment of Dish Gardens, Green Plants & Blooming Plants for a gift that adds life to any room, office or outdoor space. Shop for a variety of Unique Gifts, including plush stuffed animals, balloons, silk arrangements, home décor items, baby gifts. We also offer Year-Round Greenhouse Products. From Beautiful Hanging Baskets and Mums to Cemetary Decorations. Please call for the Seasonal products! 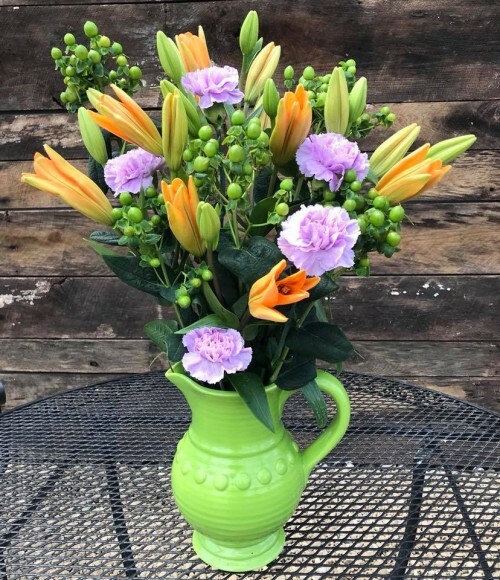 Thank you for visiting our website for flowers delivered fresh from a local Malaga, Ohio florist and easy online ordering available 24 hours a day.